Seems hilarious to me that the first thing Josh Freeman does when get gets drafted is unintentionally (or, heck, intentionally) insult a veteran QB on the team. Not the best move, there Josh. And now we hear that the Bucs are already on serious damage control. Coach Raheem Morris indicated that Freeman misspoke. "We talked about that (Sunday) morning," Morris said. "Sometimes quotes are taken out of context. The young man was asked the question and he kind of answered it the wrong way. "Hey, Leftwich called him this morning and told him he's going to put him in a headlock when he gets down here and then after that he's going to put him under his wing and get him ready to go. So, they talked on the phone this morning and I think we're okay." My guess: this damage control doesn't matter. iI have a feeling that Leftwich and a couple of other vets are gonna prank the living crap out of Freeman come mini-camp. Teixeira is batting just .222 this month, having failed to make the Yankees forget that Alex Rodriguez is on the DL until mid-May. For $180 million, the Bombers are paying Teixeira to do more than blend in; their man is supposed to be The Man, starting Friday night. For God's sakes, we all knew this was coming. Teixeira is a perennial slow starter. he's a career .252 batter in April. And every time the guys doesn't hit a 5-run home run, are we going to have to see his contract in front of his name? Yes, we know. He makes a lot of money. And again, this is not excusing Texeira or the Yankees. not at all. It's just that we have to trot out these already-tired nonsensicals of "Stadium Ghosts" and "$180 million dollars" instead of actual baseball analysis? Speaking of actual baseball analysis, here's an interesting tidbit from Yankeeprospects.com on the "Yankee Stadium wind tunnel." Jorge Posada started 13 games this season. In those 13 games, Yankee pitchers have given up at least five runs seven times. The Yankees have given up, with Jorge catching, at least 10 runs four times....It’s a small sample size that Jose Molina started but when he did start, the most runs the Yankee pitchers gave up were six runs to Kansas City. Two of those runs were unearned because of a Nick Swisher error. The other games he started, the Yankee pitchers have given up two runs, three runs, two runs, and three runs. So in short: it's not the fact that the new Yankee Stadium has a "mysterious wind tunnel" driving pop flies into the outfield seats, but rather, that Posada is calling bad games for the pitchers. Too soon to tell if this theory holds water, but it's at least interesting. Some more thoughts about the draft. It is really surprising to me that Buffalo did not take William Beatty in the second round when they had the chance. A natural left tackle with excellent athleticism, Beatty was just sitting there waiting to be selected and to replace Jason Peters. Not sure where Buffalo is going to go now with their LT position. I think the Steelers just had an excellent below the radar draft. Ziggy Hood, Mike Wallace, Kraig Urbik, A. Q. Shipley—players who may not be the flashiest or the most known—but players who fit the Steeler mode, and in a few years time, will contribute. Can't sell those seats? Donate them! To Little League or Babe Ruth organizations. To the NYPD. To the NYFD. It's a baseball stadium, not an opera house or a library, fer gosh sakes! And it'll do a world of good on so many different levels, including more purchases of food and memorabilia (ooohh, money!). Now c'mon, is that really so hard? Agreed. It would make the new Stadium a more rockin' place to be and it would do something good for a depressed NYC. As for the draft's current format...staring at 4pm on a Saturday, readers of this blog know we hate it. Now, we're hearing news that the draft might be moving again, to weekday primetime. The NFL wants to move the first round of the draft to Thursday evening during prime time. The 2nd and 3rd rounds would be on Friday night and the final 4 rounds would happen on Saturday afternoon. What do we think of it. Sure...it couldn't be worse than the system they have now, so let's see it. 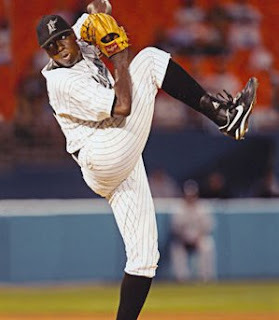 In some good news, Dontrelle Willis had a nice opening to his 2009 season. In AA-ball, Willis threw 6 innings giving up only 2 runs on 3 hits. Manager Jim Leyland said that "It was good," and that Willis will pitch a AAA game this Friday. Here's hoping that the former all-star and good guy can make it all the way back to a big league mound and pitch the way he should. Good note about Teixeira, I think I even mentioned his slow starts on here when the Yankees first signed him. RE: Posada. He may call the game, but the pitchers still throw it. Maybe they aren't locating their pitches where Posada wants them to. It would be really hard to know. When Ivan Rodriguez used to play for the Rangers one of the few knocks on him was that he called a bad game, and yet when he left he won a title with the Marlins and went to another series with Detroit.